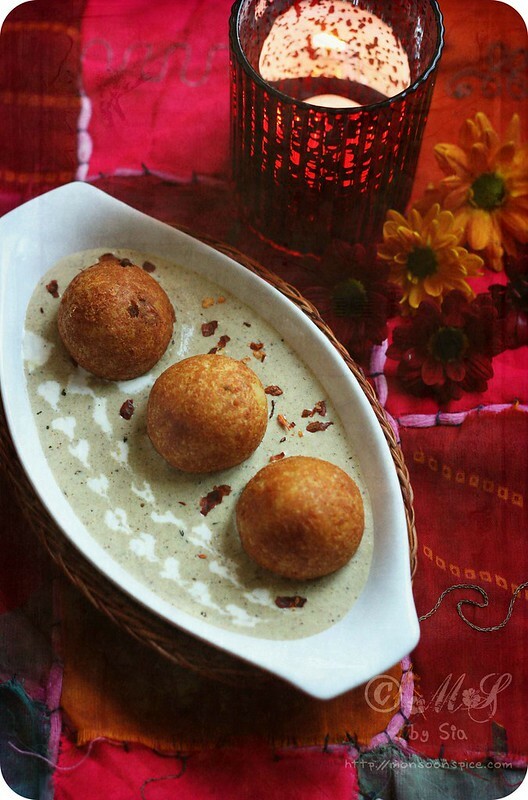 Mughlai Paneer Kofta Curry ~ For winter indulgence! I do indulge my family with deep fried goodies once in a while and it reaches its highest peak in the months of winter. When I cook something deep fried, I do not adapt the short cut technique of baking or partially frying them. After all deep fried goodies are once in a while indulgences and you should respect the food in every form! The above statement may sound very contradicting to the type of food I prepare for my family and post it here in my blog which involves not more than 1 tablespoon of oil in most of the recipes. I was born with no sweet tooth as well as no appetite for deep fried foods. But this never stopped the extra pounds sitting happily around my hips. On the other hand, HD has huge appetite for deep fried goodies as well as enormous sweet tooth and still manages to keep his weight well with in control! So for his sake, I indulge in cooking deep fried goodies once in a while just to see my man become a small boy with a smile that will put the Cheshire cat’s grin to shame!!! 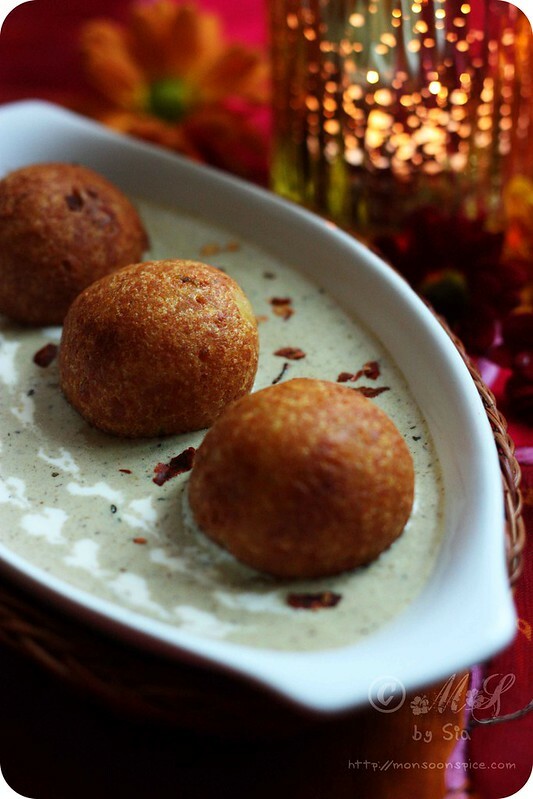 Mughlai Paneer Kofta Curry ~ Deep fried goodness! One of the deep fried goodies that I too succumb to is the Malai Kofta Curry, delicious deep fried paneer and vegetable dumplings served in equally delicious spicy onion and tomato gravy. What not to love?! 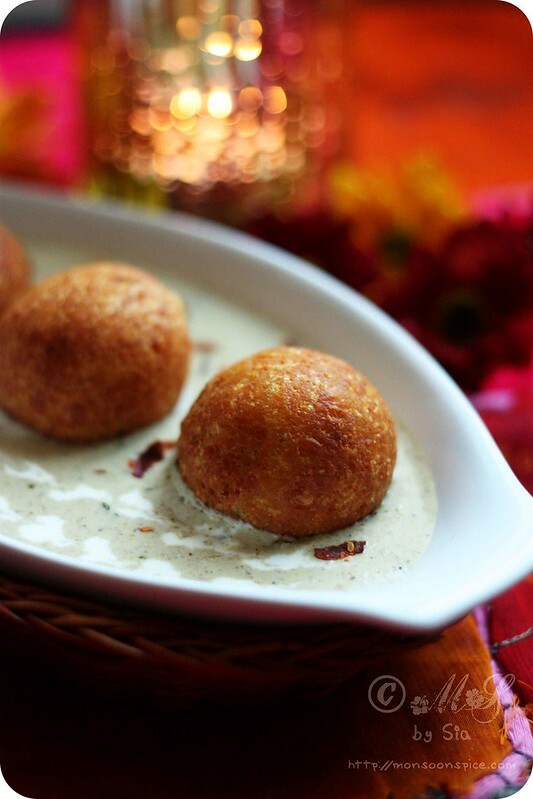 Although this Malai Kofta makes very rare appearance on our dining table, it holds very high place in our foodie hearts! So when I was planning the Diwali party menu, I knew I wanted to cook the Koftas for our guests, not to impress but to indulge them! I opted to cook different type of Koftas and the very rich, very royal and very much loved Mughlai Paneer Kofta Curry topped the list. 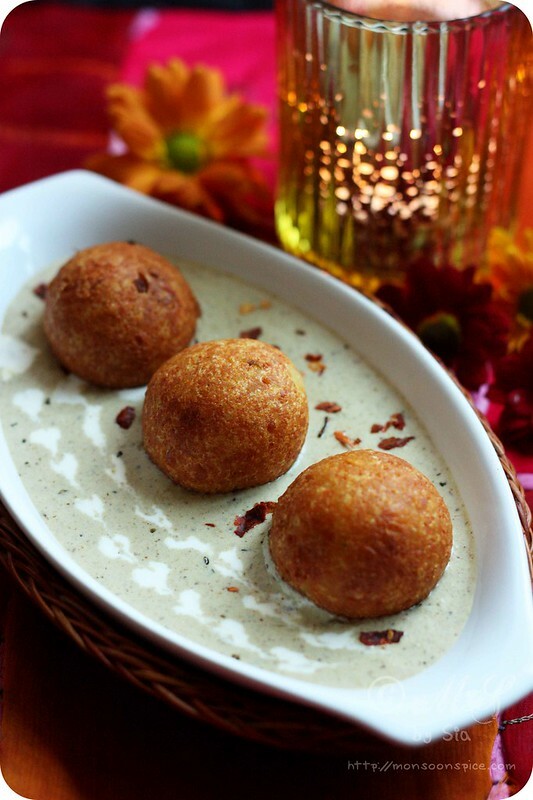 Mughlai Paneer Kofta Curry ~ Truly a dish fit for royalty! 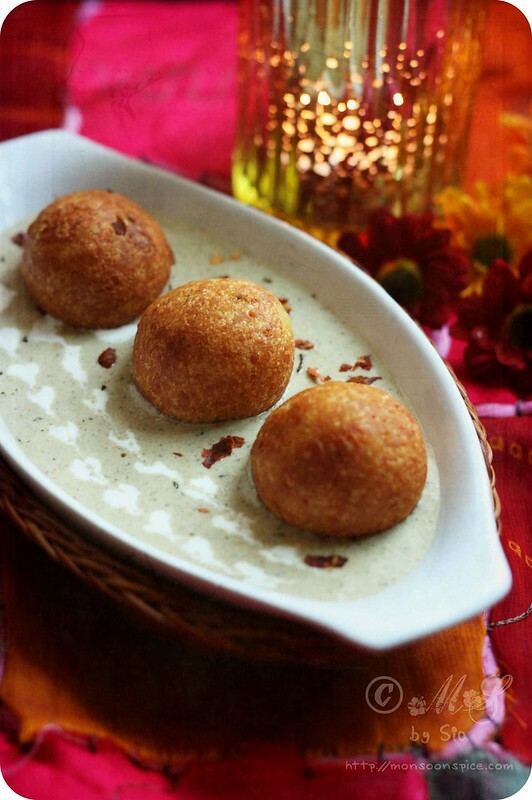 Mughlai Paneer Kofta Curry is one of the most delicious curries you will ever come across. As the name implies, this Mughlai Paneer Kofta Curry uses all the traditional and most loved ingredients used in Mughlai cuisine; paneer (Indian cottage cheese), dry nuts and fruits, cream and careful selection of spices, fit for royalty! It is not a simple dish but is not all that complicated too. The lengthy ingredients list may intimidate the beginner in cooking world, but when you go through the list carefully you will find that most of the ingredients are easy to source from any good Indian grocery store. To make it simple I have divided the cooking instructions in to 3 main divisions, first for preparing the gravy, second for making the koftas and the third to assemble them before serving. If you don’t have the time or patience to cook everything in one day, you can split the cooking process for two days by preparing the gravy on one day and making the koftas on the next day. And if you are cooking it for the party, just prepare the gravy and koftas a day before the party day. The day of party, simply heat the koftas in a microwave for 5 minutes or place them in an oven heated at 150 deg C for 10-15 minutes before serving them. Isn’t it simple now? Beginners, please go through the notes at the end of the recipe instruction which will help in answering most of your doubts/queries. Don’t feel guilty about eating one extra Kofta if your heart desires. After all it’s not everyday that you cook such rich and exquisite food! So when you make some Mughlai Paneer Kofta Curry, do indulge and feel happy about it. Sometimes rich food like this Mughlai Paneer Kofta Curry is a must to cheer our moods on dark and gloomy winter days! So do give it a try and let me know how it managed to take you on an exciting food journey by spreading some warmth and happiness! Grind onions, green chillies, cinnamon, cloves, cardamom, cumin seeds and coriander seeds to smooth paste without adding any water. Keep it aside till needed. 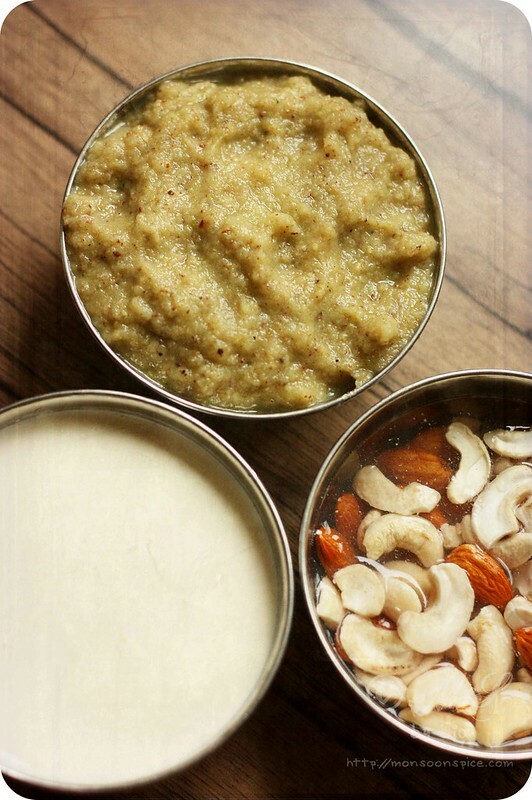 Similarly grind the soaked almonds and cashew nuts to smooth paste by using the water in which they were soaked. Keep it aside till needed. Heat oil in a pan and add ground onion paste, sugar and ginger garlic paste. Sauté it on medium flame for 5-7 minutes or till the oil starts to separate on the edge and the paste turns golden brown. It is important that the paste is well fried or the gravy will taste bitter, the sugar helps in caramelising the onions. Mix in turmeric powder, kitchen king masala/garam masala and kasuri methi and cook them for a minute. Add ground almond and cashew nut paste and mix them well. Add about 1 ½ - 2 cups of water, depending on how thick you want the gravy, and salt to taste. Reduce the flame to low and let it cook for 7-10 minutes. 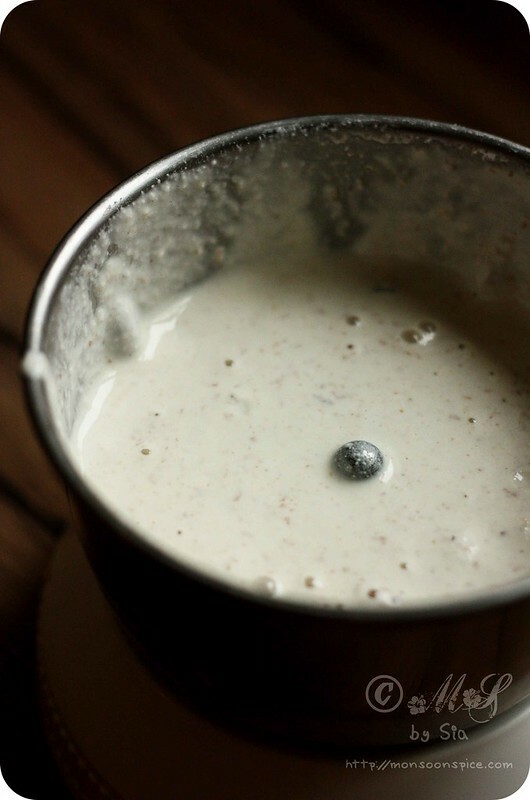 Once the gravy starts to thicken and comes to a gentle boil, add fresh cream and mix them well. Cook for another 2 minutes and then turn off the gas flame. 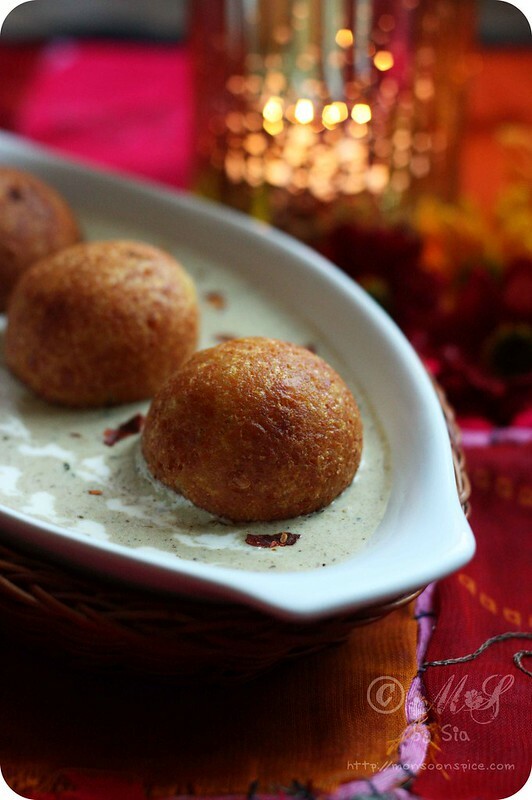 The delicious and creamy almond and cashew nut gravy is ready for the Mughlai Paneer Kofta. 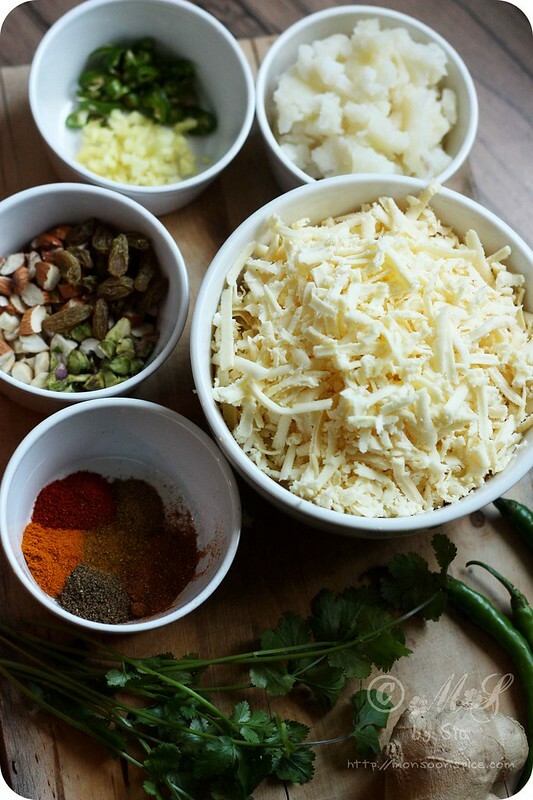 In a large bowl take crumbled/grated paneer and using hands start to knead it. Keep kneading it till all the crumbled paneer starts to form soft dough. 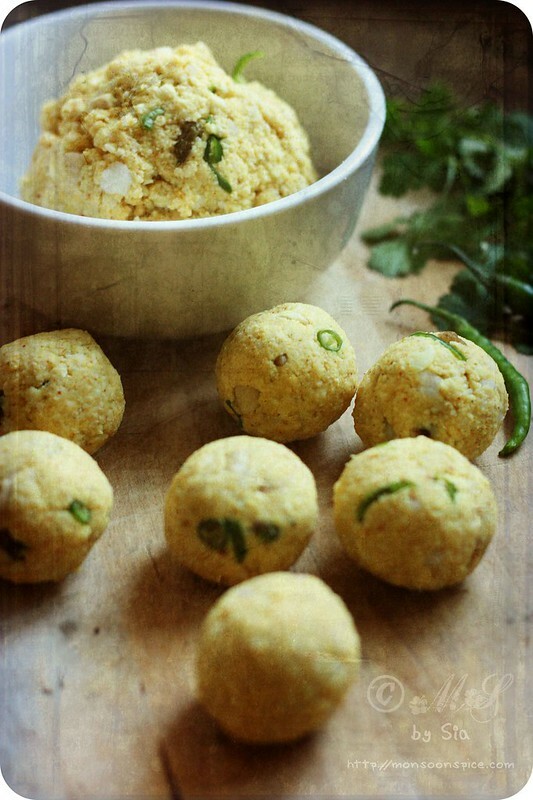 Mix in boiled potato, finely chopped green chillies, corn flour, grated ginger, turmeric powder, garam masala, kitchen king masala and salt to taste. Here you can also add finely chopped dried nuts or you can use them as a stuffing. I just added them with the paneer mix and as I didn’t see any point in spending few extra time by stuffing them. The consistency of this kofta mix is almost that of chapatti dough and you should be able to make small balls without crumbling/breaking. Once all the ingredients and mixed thoroughly, make small lime sized balls (around 2 inch) using palms by adding gentle pressure. Heat oil in a deep frying pan for deep prying the koftas and reduce the heat to medium to low. Deep fry koftas in batches of 3-4 balls at time. If the koftas start to break, add 1-2 tbsp of corn flour to the mix, combine them well and make small balls of koftas once again. Fry the koftas, turning them once in a while, till they turn crisp and golden brown in colour. Place them in a bowl lined with tissue paper to absorb any excess oil. Repeat the step till all the koftas are fried to golden brown perfection. Alternatively you can either bake them in an oven at 175 deg C for about 20-30 minutes or fry them in Appam Pan with little oil till they turn golden brown. The taste will be different from the ones deep fried. Heat the gravy for few minutes and transfer it to the serving bowl. Make sure that the oil is hot enough before deep frying the Koftas. To test if the oil is heated well, drop a small piece of kofta mixture. If it sizzles and floats to the surface of oil, the oil is ready for deep frying and if it sinks, then wait for couple of minutes before deep frying. Place one kofta at a time in deep frying pan. 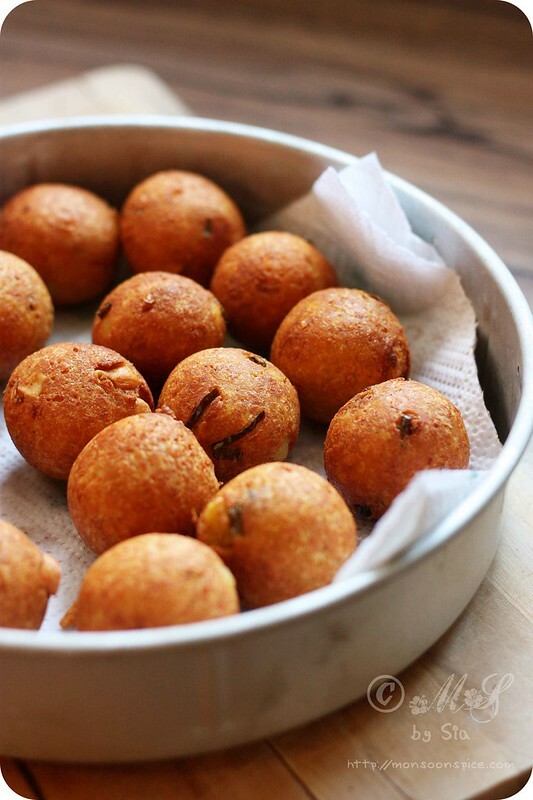 If the kofta starts to crumble or break, add 1-2 tbsp of corn flour to the mix, combine them well and make small balls of koftas once again. Don’t crowd the frying pan by adding too many koftas. To get evenly cooked, perfect golden brown coloured Koftas, always fry them in a batch of 3-4. Always fry the koftas in medium to low heat so that they are cooked well and get that lovely golden brown colour. Traditionally crumbled Khoya mixed with chopped dried nuts and fruits are used as a stuffing while making the koftas. But I didn’t have enough time or patience to stuff every koftas as I was making it in a big batch for the party and I just mixed them all together and made koftas. 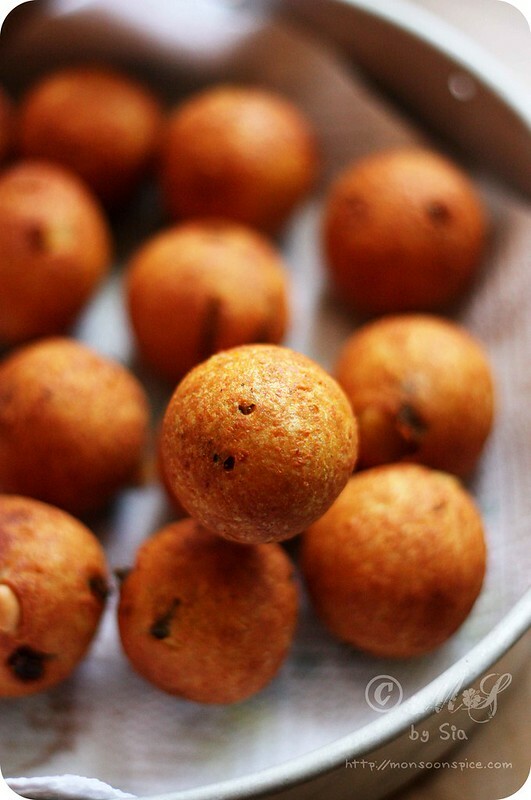 If you are not fond of deep frying, you can either bake them in an oven at 175 deg C for about 20-30 minutes or fry them in Appam Pan with little oil till they turn golden brown. The taste will be different from the ones deep fried. If you don’t have the time or patience to cook everything in one day, you can split the cooking process for two days by preparing the gravy on one day and making the koftas on the next day. And if you are cooking it for the party, just prepare the gravy and koftas a day before the party day. The day of party, simply heat the koftas in a microwave for 5 minutes or place them in an oven heated at 150 deg C for 10-15 minutes before serving them. You can freeze the gravy and koftas separately for 2-3 weeks in an air tight container or zip lock bag. When needed, place the koftas in a baking tray lined with parchment or aluminium foil and bake it for 15-18 mins at 180 deg C turning halfway through. There is no need to thaw the koftas before cooking them in an oven. Alternatively microwave them on high heat for 10 mins. Note that if you are microwaving the koftas, the koftas will not turn our crisp on the outside as they do while cooking in an oven. Srumptious looking! That is a wonderful dish. Nice Kofta curry. do visit my space at your free time. @Rosa's Yummy Yums, you are always the first one to comment on the new posts :) Thank you, dear Rosa! 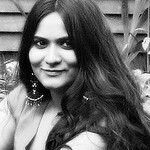 Sia..I always admired your detailed and well explained recipes and so wonderful pics..awesome job ! !have to learn a lot from you..
Oh my god! You make me drool! I've put on so much weight recently that I have no business eating any of this, but it is oh-so-tempting! What a decadent dish! Looks delicious and has me craving for meal like that! Sia, I tried the recipe. The sauce was delicious but my kofta a were not soft. They were still hard inside. Any idea how to make them softer? Sis, any ideas on how to make the koftas softer. They were quite hard on the inside. Oh dear! The only thing I can think of the amount of corn flour used, if you have added too much of corn flour then the koftas turn hard. In that case, place the koftas in a gravy for at least 2 hours so that they soak up and become soft. Hope it helps. That does help. I will try that with the leftover koftas and let you know. Thanks! It does. Thank you. I will try with left over koftas and let you know.